Presenting the McCue CUBAClinical™ Contact Ultrasound Bone Analyzer. Never before has assessing a patient's risk of fracture been easier or more cost-effective. And what's more, the CUBAClinical is designed to perform a heel measurement in less than a minute. The CUBAClinical is a patented "dry" Ultrasonic Bone Sonometry System. By placing the calcaneus (heel bone) between two directly contacting Ultrasonic Transducers, rapid measurements of Broadband Ultrasonic Attenuation (BUA) are obtained. The calcaneus is a bone site of proven sensitivity to osteoporotic change. The CUBAClinical takes an ultrasound measurement through the patient’s heel. The patient is seated with the foot accurately positioned into the footwell, using the correct positioning insert. The foot and lower part of the leg are secured using two Velcro® straps. Ultrasound gel is applied to the face of the silicone pads and to the sides of the heel to provide acoustic coupling. The silicone pads are brought into contact with each side of the patient’s heel by means of a motorized mechanism. 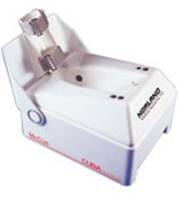 Inaudible sound waves are transmitted from one of the transducers through the heel and received by the other transducer. Quantitative parameters describing the attenuation in the heel are measured.